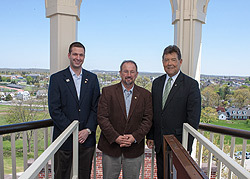 House Tourism Committee members Rep. Matt Gabler (R-Clearfield/Elk), Moul and Rep. Jerry Stern (R-Blair), committee chairman at Schmucker Hall, Gettysburg. HARRISBURG – Rep. Dan Moul (R-Adams/Franklin), who serves on the House Tourism and Recreational Development Committee, welcomed the committee to Gettysburg today for a glimpse of the events planned for the 150th anniversary of the Battle of Gettysburg. “Today, the committee toured Schmucker Hall at the Lutheran Theological Seminary in Gettysburg, which is now home to the Seminary Ridge Museum, which is scheduled to open its doors on July 1,” said Moul. “The state-of-the-art museum contains historical records, artifacts, and information chronicling the battle, the Gettysburg Address and other noteworthy events before, during and after the battle. “Of particular interest to the committee was the cupola at the top of Schmucker Hall, which provided Union General John Buford a clear vantage point when he served as lookout on the first day of the historic battle,” said Moul. “As we stood in the cupola under clear, blue skies, we were captivated by the beauty that surrounded us, and mindful of the responsibilities held by the man who stood in our place 150 years before. Organizers expect more than 4 million visitors to the Gettysburg region this year. More information on upcoming events surrounding the 150th anniversary is available at www.gettysburgcivilwar150.com.